Are you searching for any technology or product? 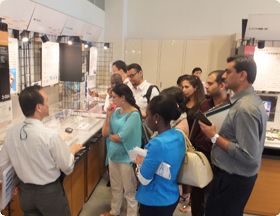 MOBIO introduces excellent SME technologies in Osaka by displaying actual products, models and panels. Guided tour is available upon request. Our coordinators assist you to identify appropriate corporation or products. Osaka industry provides with variety of products. They are for Aero-space, Automobile, Industrial Machinery, Robotics, Component, Chemical, Medical, Environmental, Fabrics, IT, etc. We will assist you to identify appropriate corporation or products. English guide is ready and MOBIO facility flyer is available in English, Chinese, Korean and Japanese. Example: Who will manufacture components of this design? - Following to the Osaka SME assistance explanation, Hall tour is scheduled.